Smart Dublin, in partnership with Enterprise Ireland, launched today five Small Business Innovation Research (SBIR) competitions with €800k in funding. The announcement was made today at the LexIcon, Dun Laoghaire Rathdown’s smart library. 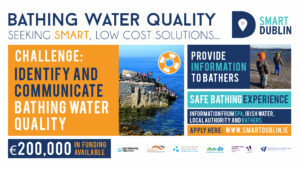 The new competitions aim to find low cost, innovative solutions to encourage engagement of the ‘unheard voices’ in decision-making; to address identification and communication of bathing water quality; to test shared and sustainable workplace mobility options for staff; to facilitate connections over an IoT radio frequency mesh network; and to optimise last mile delivery in urban centres. Philomena Poole, Chief Executive of Dun Laoghaire Rathdown County Council said “This is an excellent opportunity for small and emerging companies to get involved in demand led projects through the development of innovative solutions and technologies to address future challenges that impact on the quality of peoples’ lives”. Successful applicants will be selected by an open competition process run in two phases (feasibility and prototyping). It is open to anyone with an idea or solution, including organisations of all sizes, tech developers, solution and service providers, universities and entrepreneurs. 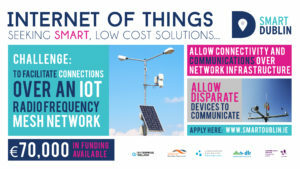 This competition follows on from the success of four previous SBIR competitions launched by Smart Dublin in 2016 and 2017. 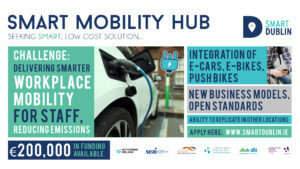 Smart Mobility Hub – Dublin City Council and SEAI seek to provide alternative, cleaner and more sustainable transportation options in both their daily commute and work day commitments through a smart mobility hub. 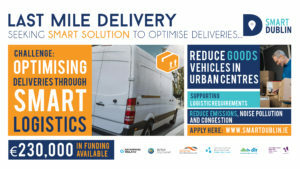 Last mile delivery – Dublin City council and Belfast City Council seek smart, low cost solutions to optimise freight and cargo deliveries in urban centres. 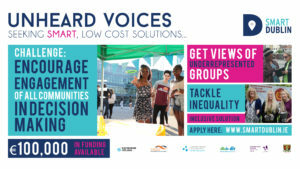 Unheard voices – Fingal County Council and Cork City Council seek smart, low cost solutions to encourage engagement of the ‘unheard voices’ in decision-making about the future of their place. Enterprise Ireland’s Small Business Innovation Research (SBIR) initiative aims to create partnerships between SMEs and public bodies to develop innovative solutions to public needs through competitive challenges. These challenges are co-funded by Enterprise Ireland and the relevant public-sector body. Since the first challenges were launched in 2016, the initiative has been gaining traction – 10 challenges are currently running across contracting authorities nationally, with 11 new challenges launching in 2018. See www.enterprise-ireland.com/sbir for further information.